Shared and private transfers are available to the Manor Marine Marina at the following rates. £62 GBP per person return or £32 GBP single Dublin airport on Saturdays or Wednesdays. Minimum cost of £160 GBP for a single transfer on Mondays, Tuesdays, Thursdays and Fridays. Belfast Private Single £165 GBP for up to 4 people or £220GBP for up to 8 people. All other transfers on request. 1. 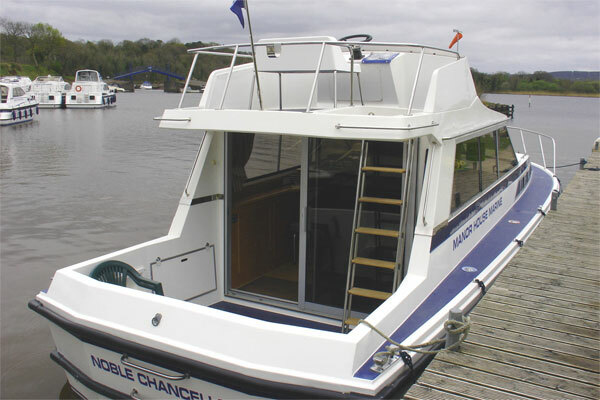 Bookings: A cruiser is not considered booked until the completed, signed Booking Form and a deposit of one quarter of the Total Hire Fee have reached the office of the Company and an invoice stating the terms for the balance of hire has been dispatched. For bookings on the Internet, a completed online booking followed by a confirmation from the Company will replace the requirement of the signed booking form. For bookings taken over the phone the Company Booking Terms & Conditions will be deemed to be accepted upon the dispatch of the Hirer’s booking confirmation by the company, which will include a copy of the said Terms & Conditions. The Company reserves the right to change the class/standard of cruiser that has been booked so long as it is an upgrade. The Company reserves the right to cancel or reject any booking at their discretion. 2. Balance of hire fees: On payment of the deposit the Hirer becomes responsible for the whole of the hire fee and the balance must be paid on or before the day of embarkation. Should the Hirer find they are unable to take over the cruiser they must notify the Company immediately. The Company will retain the deposit and the Hirer remains responsible for the balance. (Unless the Hirer has subscribed to the Cancellation Scheme, See below). 3. Embarkation and accounts: Embarkation time is between 3.00pm and 5.00pm on the commencing day of the hire period. On arrival at the Hire Base the Hirer must pay the balance of the hire fee, a refundable insurance breakage deposit of £450 (Noble Cadet), £500 (Noble Chancellor), £550 (Noble Chief), £600 (Noble Duke), £700 (Noble Captain & Noble Commander), £850 (Noble Duchess & Noble Emperor) and £100 (Outboard Motor) and the charges for any provisions and extras ordered. The Hirer should check the inventory of the craft and ensure that ample fuel has been provided. They will then be given a trial run and explanation of the running of the cruiser to confirm that the craft is in good running order. Hirers will be expected to ask if they are unsure of any aspect of the tuition. For repeat/experienced hirers a trial run may be foregone upon agreement of the Hirer and the instructor and the Hirer accepts that the craft is in good running order. 4. Novice hirers: Novice Hirers will normally be expected to accept an additional period of free tuition prior to the cruiser being handed over to them. 5. Return of cruisers: Cruisers must be returned and vacated in a clean and tidy condition to the Hire Base not later than 10.00am on the final day of the Hire Period. Failure to comply with this condition will result in an additional charge to the Hirer of £50 per hour or part thereof. After checking in, and the cruiser and equipment is found to be clean and undamaged, the insurance deposit will be refunded, subject to any additional costs incurred due to the Hirer’s negligence plus any other charges or incidental losses incurred by the Company. Such costs, charges or losses also include call out charges, damage to the chartered vessels, damage to other vessels including the recovery boat and damage, theft or loss to any dinghy or outboard motor. It is the responsibility of the Hirer to make any allowance for bad weather. The insurance deposit also covers any contingency for diesel fuel used during the hire period. 6. Service and repairs: Each member of the Company uses extreme care to ensure that craft are in good order when handed over. However, the Company cannot be held responsible for any delay in a Hirer’s programme due to breakdown or the completion of necessary repairs. Should service or repairs become necessary during the cruise, the Hirer must notify the Company then service will be carried out at no cost to the Hirer unless this has been occasioned by the Hirer’s negligence. Non-emergency call outs will be actioned during office hours. Certain repairs such as thruster failure, toilet blockages etc. may require the return of the cruiser to our base. Call outs due to a hirer’s negligence will be chargeable against the breakage deposit. 7. Insurance: Every craft and all equipment is fully insured for loss or damage. Third party risks are covered up to a maximum of £5,000,000 and the Hirer remains responsible for determining if this sum is adequate and for organising at their own cost any additional insurance that they considers desirable. 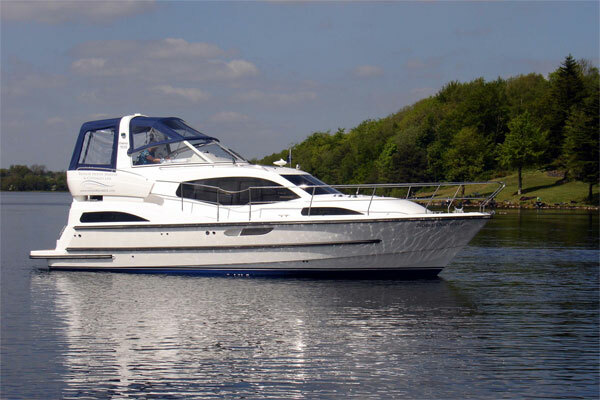 There is a £450 to £850 excess on every claim against the craft (see condition No. 3 above). The Hirer remains responsible for any loss or damage or any other legal liabilities incurred due to the Hirer’s negligence or deliberate acts (see condition No. 5 above). The Company accepts no liability for death of or bodily injury to the Hirer and/or any member of the Hirer’s party or for the loss of or damage to their property however caused. The Company advises all Hirers to ensure that they have their own valid holiday insurance for the entirety if the holiday period. 8. Late Arrivals and Sunday Arrivals: If the Hirer is due to arrive at the marina after 5pm please ensure that the Company is aware and arrangements have been made. Saturday arrivals after 6pm and non-Saturday arrivals after 5pm will receive instruction the following morning. Sunday arrivals check-in is from 10am – 4pm. The Hirer will be able to stay on the boat overnight but not be able to drive the boat until instruction has been received Monday morning. 9. Passengers: Passengers other than those notified on the booking form must not be carried on our craft at any time without prior permission of the Company. Hirer’s failing to comply with this condition will have their charter terminated immediately. 10. Accidents: The Hirer is responsible for the safe navigation of the craft on charter. In the event of an accident the Hirer must inform the Company immediately with full particulars and names and addresses of witnesses. For any loss or damage incurred before the end of the hire period the breakage deposit, or part of, will be retained by the Company and the Hirer will be required to leave a further breakage deposit or part of before the hire can continue. 11. Delay: The Company cannot be held responsible for any delay in the Hirer’s programme due to navigational works, etc., outside the control of the Company. 12. 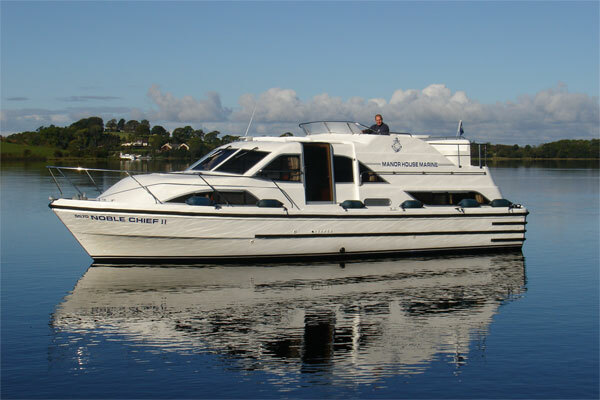 Availability of craft: If, owing to circumstances beyond the control of the Company, the cruiser booked is not available, every effort will be made to supply a similar craft. Should this not be possible the deposit will be refunded in full, but the Hirer shall have no claim against the Company. 13. Navigation restrictions: Cruisers are not permitted to navigate during the hours of darkness. 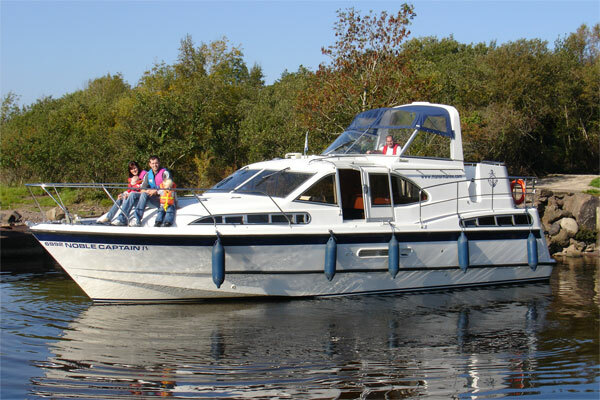 Normally the whole of the Erne Navigation is open to Hirers, but the Company reserves the right to restrict any part of the waterway to Hirers should abnormally low water or abnormal weather conditions render this necessary. 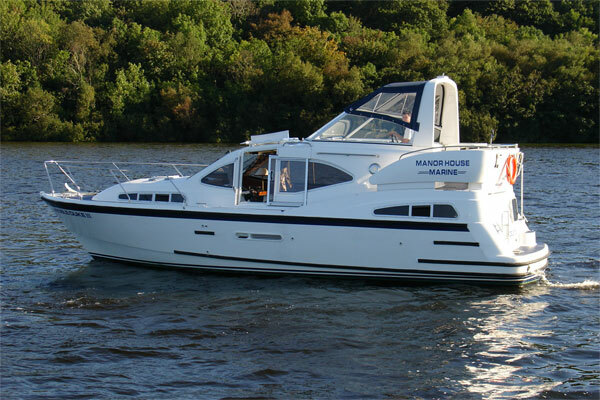 Hirers must receive permission from the Company prior to entering the Shannon-Erne Waterway or the River Shannon. The Company also reserves the right to refuse to hand over a craft to any Hirer not considered suitable to take charge. 14. Outboard Motor: The Hirer is solely responsible for any outboard motors or dinghy’s hired from the Company. 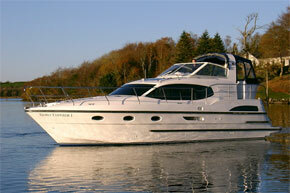 A £100 charge is added to the insurance breakage deposit of the chartered cruiser for all outboard motors hired. This entire breakage deposit remains liable for any damage, theft or loss incurred including submersion to any outboard motor and / or hired dinghy. 15. Towing: No craft may undertake towing without prior permission. 16. Pets: Prior permission must be obtained before pets will be allowed on hire craft. Dogs are not allowed on-board. 17. Hirer’s Property: The Company accepts no liability for loss or damage to Hirer’s property, baggage, motor cars, etc. Hirer’s cars are only driven or parked on the Hirer’s orders and insurance cover is assumed to have been provided by the Hirer. 18. Literature: Every care has been taken to ensure that all literature and information provided is correct but the Company cannot be held responsible for any inaccuracies or that of any travel agent. Minor variations exist in craft of the same type class. The Company reserves the right to change the layout of the craft and equipment without notice. Plans and maps are not necessarily to scale. 19. Fuel: Craft will be handed over with full fuel tanks. A fuel deposit of £300 is required on embarkation to cover any contingency. Fuel used during the hire period will be charged at the current rate for diesel. 20. Age: Cruisers may not be hired by persons under the age of 21 years. If you are compelled to cancel a booking; you must notify the Company immediately by phone (+44 (0) 28 68628100) and in writing. The deposit is then forfeited. If the cancellation is received 45 days or less before the Hire starting date, the Hirer is responsible for the whole balance of hire money if the property is not re-let, even if unfortunate circumstances prevent you from taking over your accommodation. The Company has arranged a scheme to indemnify the Hirer from this liability. The scheme is entirely voluntary but the hirer is advised to subscribe. The fee is 5% of the total Hire charge. Details of the scheme are below. Add 10 days free cancellation to your currently non-transferable non-refundable booking. By selecting this option you can cancel your reservation by notifying the Company, firstly by phone and secondly in writing (email or letter), up to 10 days before arrival. This will indemnify you from the balance of hire and you will receive a refund of any deposit paid less a £50 administration charge. 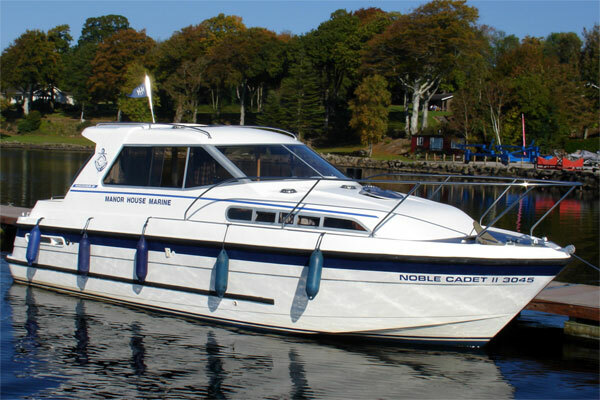 The Noble family and staff are proud to offer one of the most modern fleet of hire cruisers in Ireland, all cruisers have been exclusively designed and equipped to offer a boating holiday of a lifetime. Facilities available on all cruisers include heating, toilet/shower, fridge, rowing dinghy, fabric seating, duvets, safety equipment, etc. 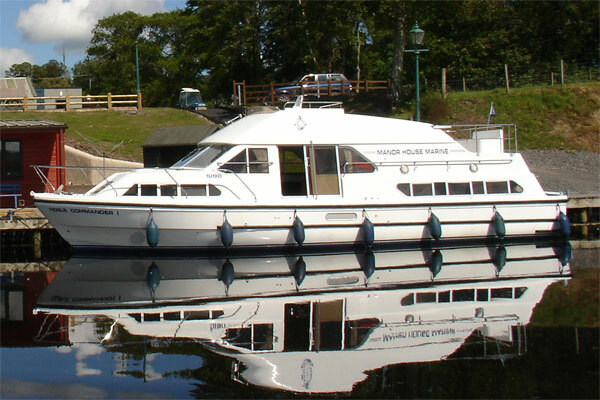 Our large and sheltered harbour is situated in our own grounds with a private island. We are in one of the most picturesque and best fishing areas of Lough Erne.